U.N. Rescinds Offer For Iran To Take Part In Syrian Peace Talks : The Two-Way The main group opposing the Assad regime had issued an ultimatum saying it would pull out unless the invitation to Tehran was revoked. 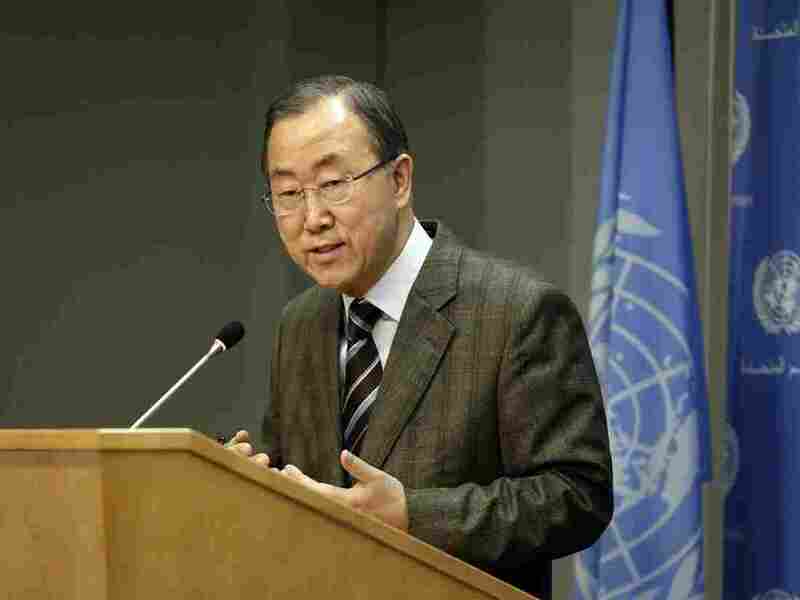 United Nations Secretary-General Ban Ki-moon addresses the media during a news conference at U.N. headquarters in New York on Sunday. This post was updated at 4:35 p.m. ET. U.N. Secretary-General Ban Ki-moon has withdrawn an invitation to Iran to participate in Syrian peace talks after groups opposing President Bashar Assad's regime threatened a boycott of the discussions if Tehran got a seat at the table. The change of heart comes barely a day after Ban asked Iran to take part — a move that threw the whole idea of talks into doubt. Within hours of the original offer, however, the U.N. chief said he was "urgently considering his options" in light of the "disappointing conduct of some participants." Immediately following Ban's backtracking, Syria's main opposition group, which had issued an ultimatum saying it would not send representatives if Iran was taking part, reaffirmed its participation in the talks. Washington also welcomed the about-face. State Department spokeswoman Jen Psaki said: "We are hopeful that, in the wake of today's announcement, all parties can now return to focus on the task at hand, which is bringing an end to the suffering of the Syrian people and beginning a process toward a long overdue political transition." The U.S. had also insisted that Iran's invitation be rescinded unless Tehran made "explicit and public support for the full implementation of the Geneva communique including the establishment of a transitional governing body by mutual consent with full executive authorities," the State Department said in an earlier statement. Tehran refused to accept any such preconditions. "The Islamic Republic of Iran appreciates the efforts of the UN Secretary General and his special envoy, Mr. Brahimi, in finding a political solution for Syrian crisis," Iran's ambassador to the United Nations, Mohammed Khazee, said in a statement on Monday. "However the Islamic Republic of Iran does not accept any preconditions for its participation" in the conference. The talks would have almost certainly unraveled if the Syrian opposition had refused to participate. Ban extended the invitation for Tehran to attend the first day of talks after he "received assurances from Iran that it accepted the premise of the talks — to establish a transitional government for Syria, which has been led by the Assad dynasty since 1970," The Associated Press says. As NPR's Deborah Amos reports on Morning Edition, even without Iran's controversial participation, "the expectations are low" for the success of the talks, which have been dubbed Geneva II. "The warring parties are reluctant. Some of the most important players, including powerful armed rebel groups, are not on the invitation list," Deborah reports. She notes that while Syria, at Russia's prodding, was the first to sign on for the talks, they pose a threat to the Assad regime, which would be threatened by any compromise that might end the country's brutal civil war. Speaking on Morning Edition, Rami Khouri, the director of the Fares Institute at the American University in Beirut, says that most of the world recognizes the need for Iran to be at the talks. Iran, he says, is "the most significant supporter, funder, backer, armer, trainer, and everything else, of Syria."